Over the past several months my grocery budget has gotten pretty out of control. It started out innocently enough. When I had the baby in May I stopped doing the grocery shopping. It was much easier to send my husband than to pack up the baby and take her. Especially since she only wants me…all of the time. Anyway, back to that darn grocery budget. You see, my husband and I shop VERY differently. He is a foodie, name brander, and not a budgeter and I am the opposite of all of those things. 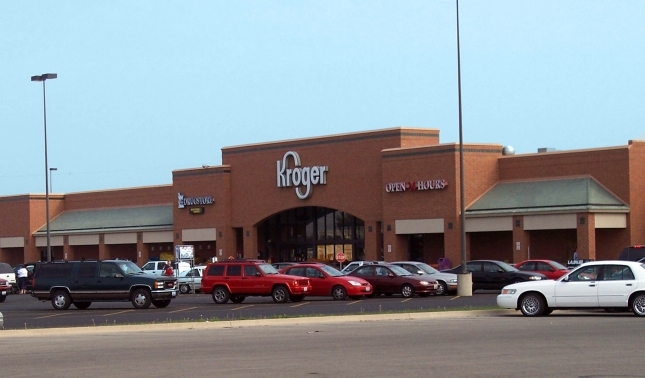 So when our local Kroger announced that it was offer curb side grocery pick up I was on it….like, literally that day! Log into your Kroger account select ClickList and put all the groceries you want in your online cart. Pick a day and time you want to pick up your groceries. A happy Kroger employee (they’re the best!) will bring you your groceries and load them in your car. Right now our Kroger does not charge a fee for this but when they do it will be $4.95. Completely worth it in my book. Since we’ve been using ClickList for a little over a month we’ve saved 25-40% off our weekly grocery spending, depending on what needs bought. Of course, we were coming from a place of buying excess but even without that problem I think this service can save almost anyone some money. Easier to Price Compare – I don’t know about you but I’m not going to stand in an aisle full of 15 people and price compared. No. Instead I’m going to quickly grab what I need and get the heck out of there. Shopping online makes it MUCH easier to price compare. Easier to Plan Out Meals – I try to plan out suppers each week and by doing this I can add things to my cart while doing so. You Can Use Digital Coupons – You can still use the Kroger digital coupons. I’ve been saving about $6 or so per week with these since I mostly buy generic. If you’re like me you go into the grocery store with good intentions but it’s so easy to add more to your cart than you need. This eliminates all of that and can be a HUGE money saver. If you’re having trouble with grocery spending, I definitely recommend giving ClickList or some other type of curbside pickup a try. It’s easy, super convenient, and may end up being the savior to your grocery budget as well!